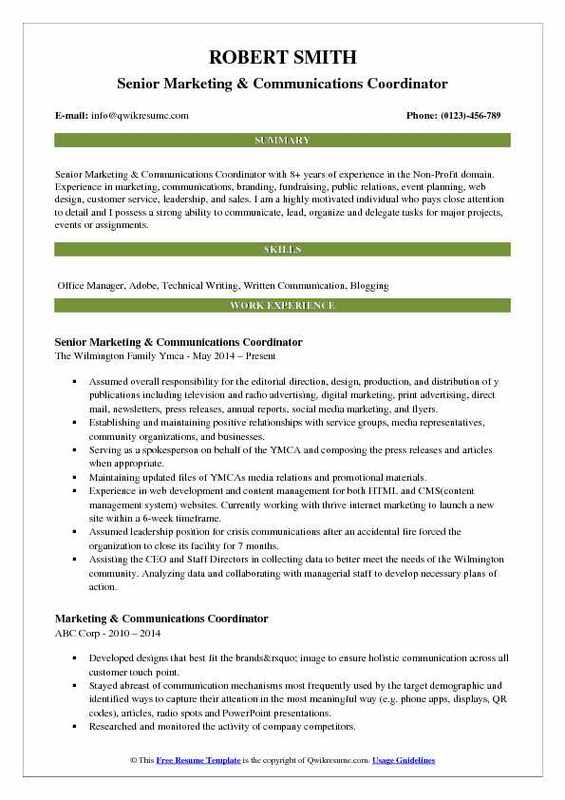 Marketing Communications Coordinator delivers the message of the organization to the public and media by developing materials and interacting with both internal and external clients. 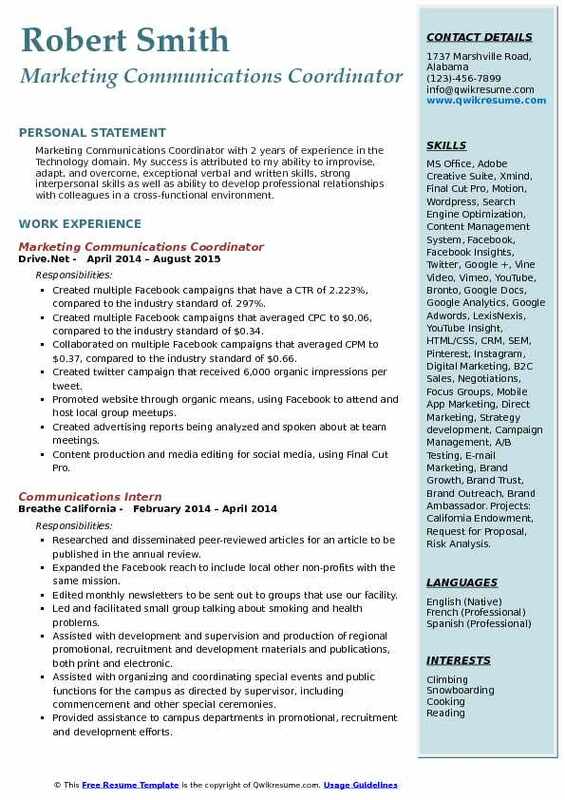 Responsibilities included in the Marketing Communications Coordinator Resume sample include producing content for the website, supporting executive staff in administrative duties, ensuring production timeline development, writing a press release, writing newsletters and content for company and developing publications. These coordinators contribute to facilitating marketing campaign, creating timelines, scheduling meetings and assisting in conducting events. A Marketing Communications Coordinator to become successful in this position needs to possess some important abilities like – excellent verbal and written communication, personable demeanor, and outstanding organizational ability leadership and time management skills. 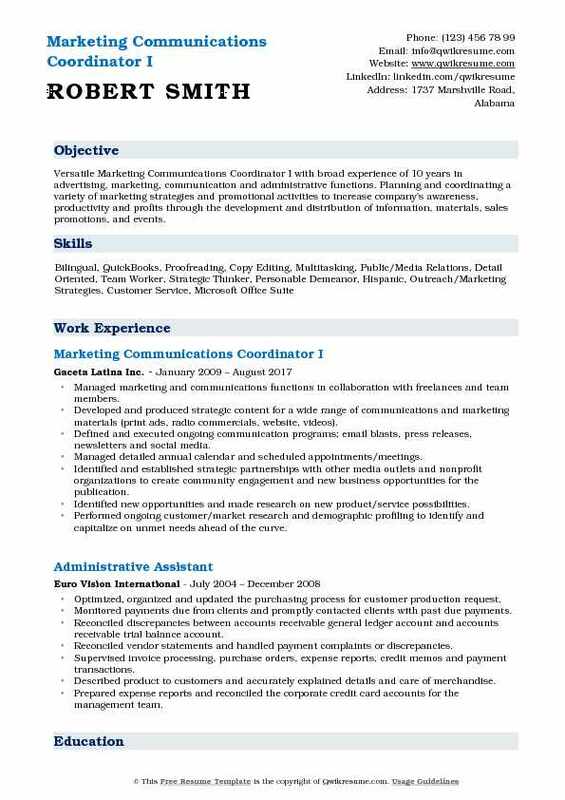 Educational background for marketing communications coordinator includes a Bachelor’s degree in Marketing or Administration or its related field. Summary : Passionate, forward-thinking Marketing Communications Coordinator with 13 years of experience in the Non-Profit domain, with a history of success creating a compelling brand identity, advertising and communications materials that capture the attention of targeted audiences through print, web and social media. Proven ability to manage marketing and mission-driven projects with superior on-time, on-budget, and on-target results. Development and execution of communication and marketing campaigns with consistent messaging including working closely with business units to develop external communication plans that effectively meet identified business objectives. Ensuring external communications are effectively distributed through identified communication channels. Keeping senior management abreast of communications that are distributed to the membership. Managing email database including subscription, bounce backs, and unsubscribed recipients. Writing email and website content to increase website traffic amongst target audience visitors. Internal communications - developing and maintaining effective communication channels. Developing internal communications through SharePoint to increase employee engagement and enthusiasm. Brand development - playing an active role in developing the brand and ensuring employees follow guidelines through identification and rollout of the new brand both internally and externally. Assisting business units with updating the existing documents/collateral to the new brand. Development of brand guidelines and ensuring they are kept up-to-date and distribute regular updates to employees to ensure guidelines are followed. Creating and maintaining the organizational brand consistency across all platforms, including collateral materials, advertising, digital, and signage. Planning, creating and managing the production and placement of a wide range of projects, including print advertising, collateral materials, outdoor advertising and special projects. Planned, created and executed the first Johnson Memorial Promotion Campaign in Greenwood Park Mall. This showcased our physician network and current branding campaign, resulting in high level of physician satisfaction - a key factor in recruiting and retaining quality medical staff, as well as a promoted brand in the key. Designing, writing, and photograph facebook advertising for physicians, the hospital and specific medical services,. Creating and executing a campaign to introduce a new team of highly regarded physicians to the Greater Johnson county community utilizing multiple media - digital, print and outdoor advertising. Managing creative projects for internal departments, including a welcome and registration packet for new maternity patients given to them by their OB, which has been recognized as a highly effective communication tool for the patient and her family. This has increased the compliance of patients to follow necessary. 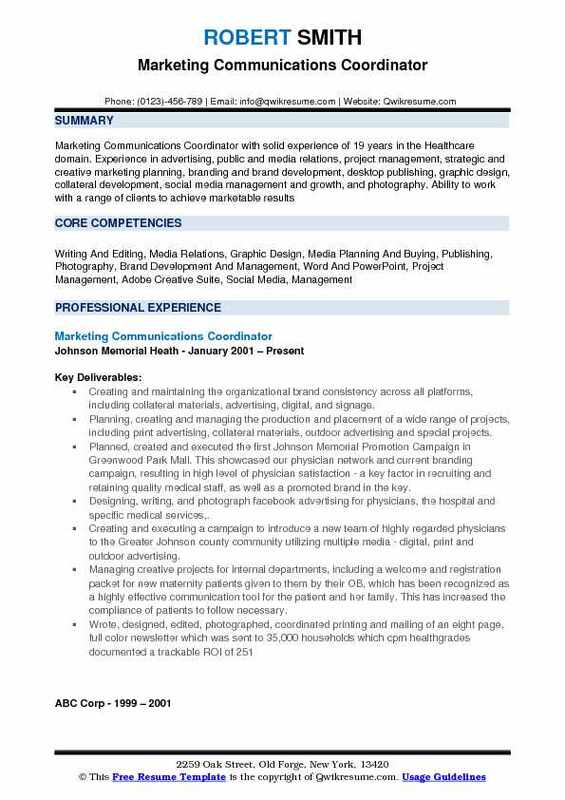 Summary : Senior Marketing & Communications Coordinator with 8+ years of experience in the Non-Profit domain. Experience in marketing, communications, branding, fundraising, public relations, event planning, web design, customer service, leadership, and sales. I am a highly motivated individual who pays close attention to detail and I possess a strong ability to communicate, lead, organize and delegate tasks for major projects, events or assignments. Assumed overall responsibility for the editorial direction, design, production, and distribution of y publications including television and radio advertising, digital marketing, print advertising, direct mail, newsletters, press releases, annual reports, social media marketing, and flyers. Establishing and maintaining positive relationships with service groups, media representatives, community organizations, and businesses. Serving as a spokesperson on behalf of the YMCA and composing the press releases and articles when appropriate. Maintaining updated files of YMCA's media relations and promotional materials. Experience in web development and content management for both HTML and CMS(content management system) websites. Currently working with thrive internet marketing to launch a new site within a 6-week timeframe. Assumed leadership position for crisis communications after an accidental fire forced the organization to close its facility for 7 months. Assisting the CEO and Staff Directors in collecting data to better meet the needs of the Wilmington community. Analyzing data and collaborating with managerial staff to develop necessary plans of action. Planning and coordinating special events and assisting in supporting organization activities and events where appropriate. Assisting in writing and directing videos for television and digital advertising. Summary : Experienced Marketing & Communications Coordinator I with 10 years of experience in the Customer Service domain is seeking to fill an executive role in the design industry. Repeatedly recognized for top performance through promotions and selection for high-priority initiatives. 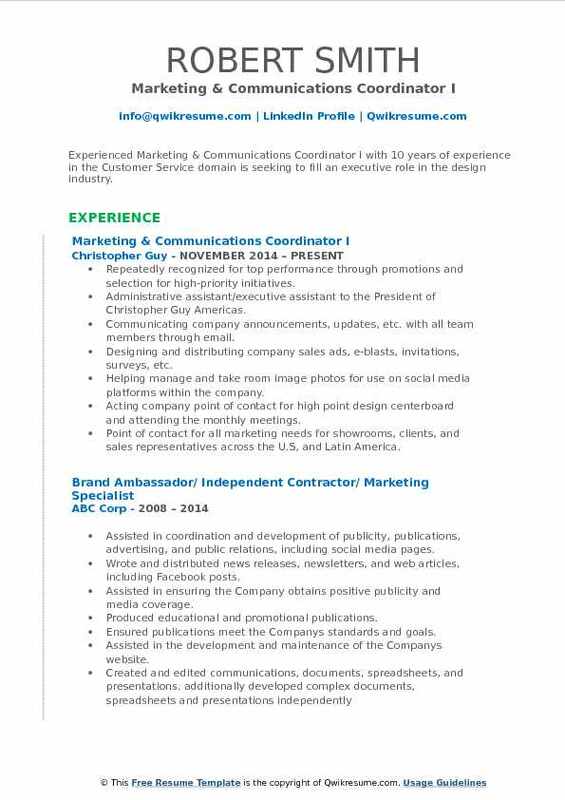 Administrative assistant/executive assistant to the President of Christopher Guy Americas. Communicating company announcements, updates, etc. with all team members through email. Designing and distributing company sales ads, e-blasts, invitations, surveys, etc. Helping manage and take room image photos for use on social media platforms within the company. Acting company point of contact for high point design centerboard and attending the monthly meetings. Point of contact for all marketing needs for showrooms, clients, and sales representatives across the U.S, and Latin America. Ordering entry price quotations, and product specifications for customers as needed. Arranging all catering, food, beverage, supplies etc. for quarterly markets. Coordinating and managing all travel/accommodations for team members including international during quarterly markets. Marketing and event management for quarterly furniture markets in High Point and Las Vegas. 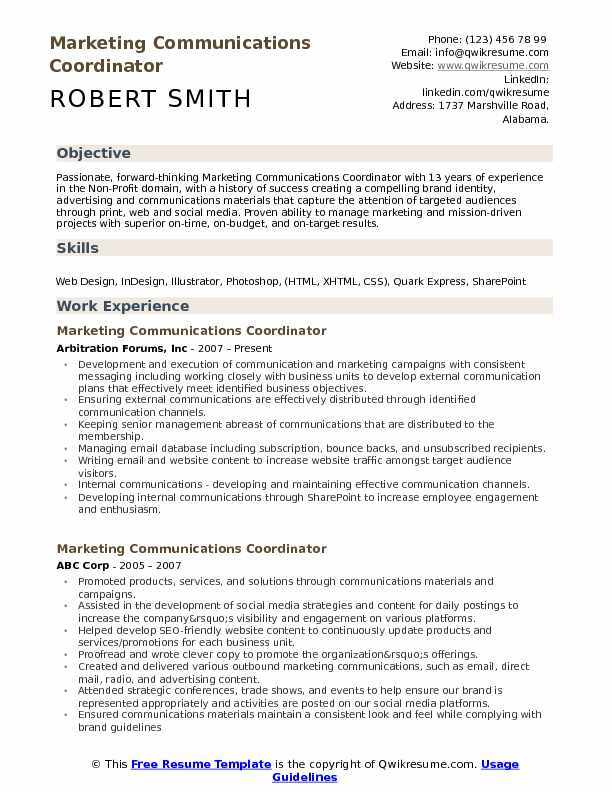 Objective : Marketing Communications Coordinator with 2 years of experience in the Technology domain. My success is attributed to my ability to improvise, adapt, and overcome, exceptional verbal and written skills, strong interpersonal skills as well as ability to develop professional relationships with colleagues in a cross-functional environment. Skills : MS Office, Adobe Creative Suite, Xmind, Final Cut Pro, Motion, Wordpress, Search Engine Optimization, Content Management System, Facebook, Facebook Insights, Twitter, Google +, Vine Video, Vimeo, YouTube, Bronto, Google Docs, Google Analytics, Google Adwords, LexisNexis, YouTube Insight, HTML/CSS, CRM, SEM, Pinterest, Instagram, Digital Marketing, B2C Sales, Negotiations, Focus Groups, Mobile App Marketing, Direct Marketing, Strategy development, Campaign Management, A/B Testing, E-mail Marketing, Brand Growth, Brand Trust, Brand Outreach, Brand Ambassador. Projects: California Endowment, Request for Proposal, Risk Analysis. Created multiple Facebook campaigns that have a CTR of 2.223%, compared to the industry standard of. 297%. Created multiple Facebook campaigns that averaged CPC to $0.06, compared to the industry standard of $0.34. Collaborated on multiple Facebook campaigns that averaged CPM to $0.37, compared to the industry standard of $0.66. Created twitter campaign that received 6,000 organic impressions per tweet. Promoted website through organic means, using Facebook to attend and host local group meetups. Created advertising reports being analyzed and spoken about at team meetings. Content production and media editing for social media, using Final Cut Pro. Prepared forms for special event marketing including ordering electricity, event support, and booking travel. Responsible for all company assets pertaining to events, including assisting with the set-up of on-site displays. Coordinated production of marketing materials and accessories such as: shirts, fliers, and key chains. Managed creation and distribution of sales related emails and postcards. 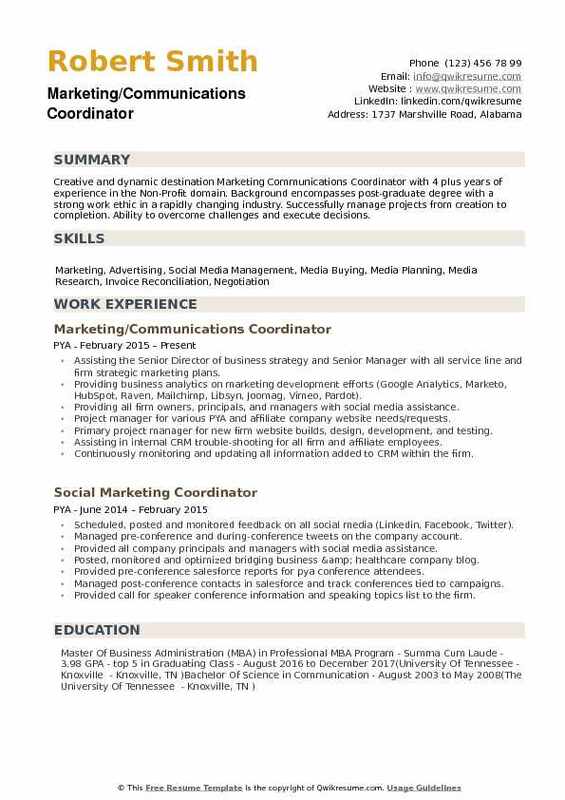 Summary : Versatile Marketing Communications Coordinator I with broad experience of 10 years in advertising, marketing, communication and administrative functions. Planning and coordinating a variety of marketing strategies and promotional activities to increase company's awareness, productivity and profits through the development and distribution of information, materials, sales promotions, and events. Managed marketing and communications functions in collaboration with freelances and team members. Developed and produced strategic content for a wide range of communications and marketing materials (print ads, radio commercials, website, videos). Defined and executed ongoing communication programs; email blasts, press releases, newsletters and social media. Managed detailed annual calendar and scheduled appointments/meetings. Identified and established strategic partnerships with other media outlets and nonprofit organizations to create community engagement and new business opportunities for the publication. Identified new opportunities and made research on new product/service possibilities. Performed ongoing customer/market research and demographic profiling to identify and capitalize on unmet needs ahead of the curve. Performed reader’s surveys to update relevant information for the publication, such as; current readership’s audience, level of satisfaction, the effectiveness of content and advertising. Created and updated media kit material to demonstrate key marketing analytic and demographics for use in sales presentations. Represented company’s products and conduct sales presentations in different networking events. Provided editorial direction and assure that all communications collateral was edited to increase brand awareness & interest in the Spanish publication. Assure the editorial accuracy and consistency of communication content. Also established editorial standards & oversees copywriting & editorial workflow. 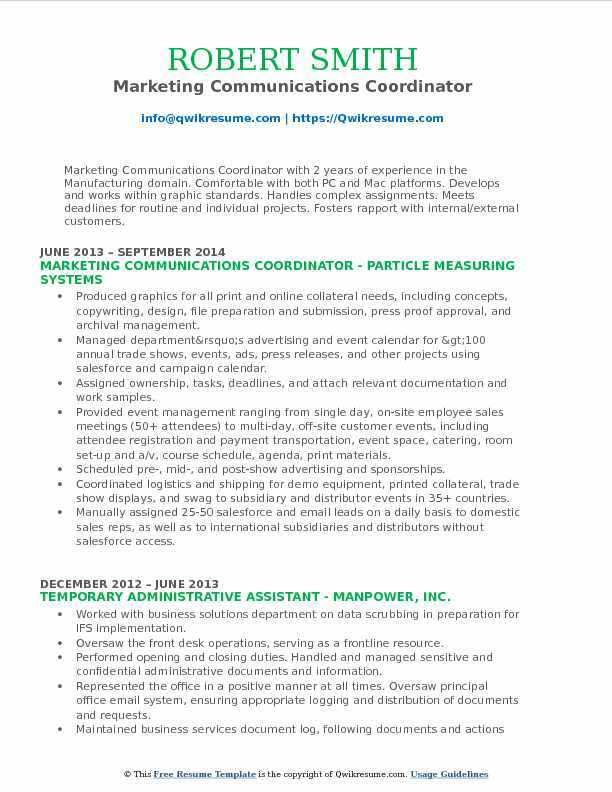 Objective : Marketing Communications Coordinator with 2 years of experience in the Manufacturing domain. Comfortable with both PC and Mac platforms. Develops and works within graphic standards. Handles complex assignments. Meets deadlines for routine and individual projects. Fosters rapport with internal/external customers. Produced graphics for all print and online collateral needs, including concepts, copywriting, design, file preparation and submission, press proof approval, and archival management. Managed department’s advertising and event calendar for >100 annual trade shows, events, ads, press releases, and other projects using salesforce and campaign calendar. Assigned ownership, tasks, deadlines, and attach relevant documentation and work samples. Provided event management ranging from single day, on-site employee sales meetings (50+ attendees) to multi-day, off-site customer events, including attendee registration and payment transportation, event space, catering, room set-up and a/v, course schedule, agenda, print materials. Scheduled pre-, mid-, and post-show advertising and sponsorships. Coordinated logistics and shipping for demo equipment, printed collateral, trade show displays, and swag to subsidiary and distributor events in 35+ countries. Manually assigned 25-50 salesforce and email leads on a daily basis to domestic sales reps, as well as to international subsidiaries and distributors without salesforce access. Acted as a liaison with international subsidiaries and distributors to process yearly distribution. Summary : Dynamic and performance-driven Marketing Communications Coordinator with 10 years of experience in the Technology domain, with strong organizational, customer service and communication skills. Multi-disciplinary industry expertise with an emphasis in marketing, communications, and administration. 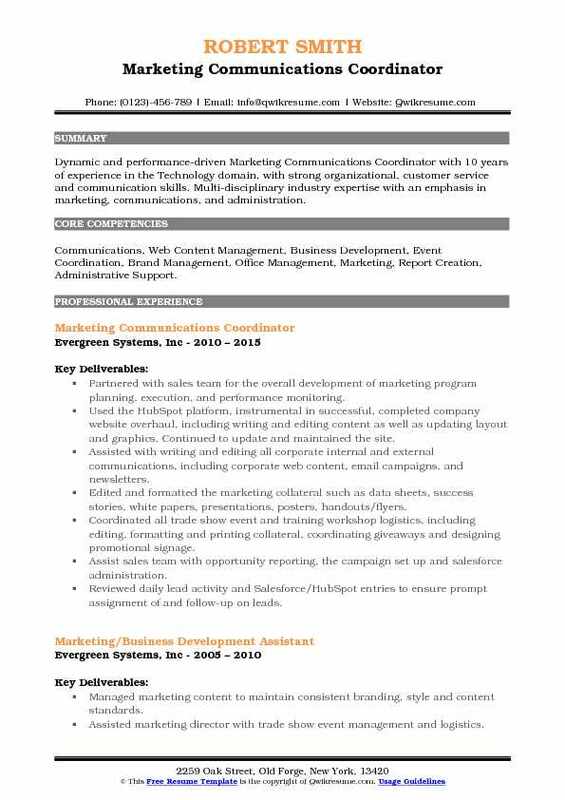 Skills : Communications, Web Content Management, Business Development, Event Coordination, Brand Management, Office Management, Marketing, Report Creation, Administrative Support. Partnered with sales team for the overall development of marketing program planning, execution, and performance monitoring. Used the HubSpot platform, instrumental in successful, completed company website overhaul, including writing and editing content as well as updating layout and graphics. Continued to update and maintained the site. Assisted with writing and editing all corporate internal and external communications, including corporate web content, email campaigns, and newsletters. Edited and formatted the marketing collateral such as data sheets, success stories, white papers, presentations, posters, handouts/flyers. Coordinated all trade show event and training workshop logistics, including editing, formatting and printing collateral, coordinating giveaways and designing promotional signage. Assist sales team with opportunity reporting, the campaign set up and salesforce administration. Reviewed daily lead activity and Salesforce/HubSpot entries to ensure prompt assignment of and follow-up on leads. Performed lead qualification activities via outbound phone and email campaigns. Generated standard and customized reports in support of marketing and sales activities. Assisted upper-level management by writing executive bios for speaking engagements and updating resumes. 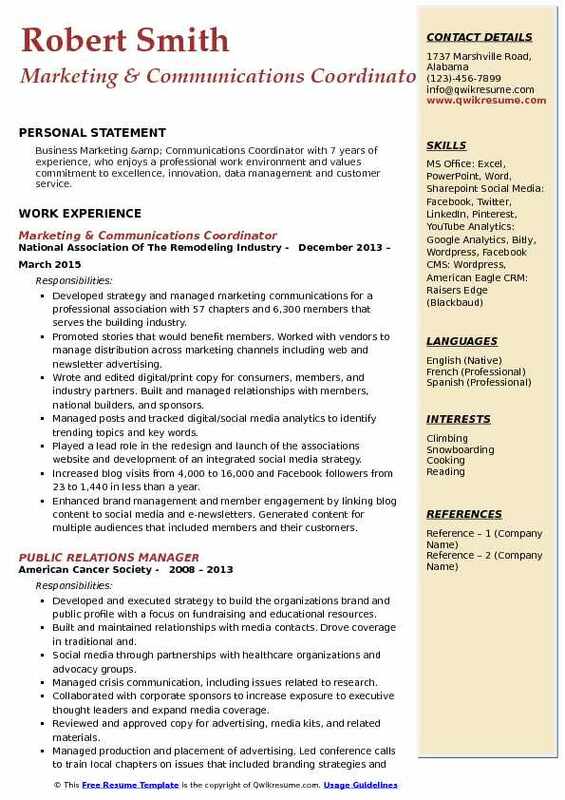 Summary : Business Marketing & Communications Coordinator with 7 years of experience, who enjoys a professional work environment and values commitment to excellence, innovation, data management and customer service. Developed strategy and managed marketing communications for a professional association with 57 chapters and 6,300 members that serves the building industry. Promoted stories that would benefit members. Worked with vendors to manage distribution across marketing channels including web and newsletter advertising. Wrote and edited digital/print copy for consumers, members, and industry partners. Built and managed relationships with members, national builders, and sponsors. Managed posts and tracked digital/social media analytics to identify trending topics and key words. Played a lead role in the redesign and launch of the association's website and development of an integrated social media strategy. Increased blog visits from 4,000 to 16,000 and Facebook followers from 23 to 1,440 in less than a year. Enhanced brand management and member engagement by linking blog content to social media and e-newsletters. Generated content for multiple audiences that included members and their customers. Managed editor for a blog, which was named twice as top industry micro-blog. Wrote collateral materials, including e-blasts, and direct mail for 56 chapters. Created a system to manage and track stages of digital and social media projects. Managed social media channels. Objective : Creative and dynamic destination Marketing Communications Coordinator with 4 plus years of experience in the Non-Profit domain. Background encompasses post-graduate degree with a strong work ethic in a rapidly changing industry. Successfully manage projects from creation to completion. Ability to overcome challenges and execute decisions. Assisting the Senior Director of business strategy and Senior Manager with all service line and firm strategic marketing plans. Providing business analytics on marketing development efforts (Google Analytics, Marketo, HubSpot, Raven, Mailchimp, Libsyn, Joomag, Vimeo, Pardot). Providing all firm owners, principals, and managers with social media assistance. Project manager for various PYA and affiliate company website needs/requests. Primary project manager for new firm website builds, design, development, and testing. Assisting in internal CRM trouble-shooting for all firm and affiliate employees. Continuously monitoring and updating all information added to CRM within the firm. Posting/disseminating, monitoring and optimizing national, regional and local press releases. Banner ad campaign management for 10+ service line and affiliate campaigns. Managing post-conference contacts in CRM and tracking opportunities tied to marketing or development initiatives.